Nijinsky | WHAT A FEELING! It’s weird: Herbert Ross is this choreographer-turned-director, and one might expect that he would bring a quality of dance to his films. One would be wrong, though, because Ross, even when ostensibly dealing with dance in his movies (in The Turning Point and now his latest film, Nijinsky), photographs his action in the flattest manner possible; and what’s worse, he shoots the dancing sequences as though they were stretches of dialogue. 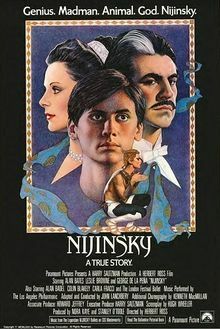 The clumsy direction of the ballets in Nijinsky (cutting off George De La Pena’s brilliantly gliding figure at the waist, or using slow-motion that is absolutely awe-deflating during jumps) is the biggest disappointment of the movie; dance is quickly dispensed with so we can watch more very unshocking soap opera. There is one aspect of this movie that is potentially intriguing: the film begins with a lengthy dolly into the insane face of Nijinsky, strait-jacketed in an asylum. Dissolve into the story proper, and then at the finish of the meat of the movie (volatile relationship between Diaghilev and Nijinsky, teacher and student, master/slave—you know) another dissolve into Nijinsky’s eyes, still mad, as we saw him in the first shot. Hey! Cabinet of Dr. Caligari, right? The whole thing was from the point of view of a crazy man, so everything in the movie is thrown into question…that would be great, if the movie worked that way, but nothing’s made of it; this framing device is no more than just that: a device, and the subtle ways in the Nijinsky’s point of view might change and disrupt the narrative are not dealt with. There’s nothing like the expressive Expressionism of Caligari here: is the director trying to tell us that the vision of an artist like Nijinsky is as pedestrian as that of a Herbert Ross? Gee, this is sounding more down than I intended it to be—Nijinsky is a watchable film, nice to look at (the adjective “handsome” keeps cropping up in reviews, and it seems appropriate—well-tailored but unexciting), with a good feel for the backstage maneuvering and compromises of a traveling company (true of The Turning Point as well), and featuring a very funny supporting performance by Alan Badel as the weary, bitchy benefactor of the Ballets Russes. But at the end, when a series of stills of Nijinsky are flashed on the screen, we’d like to feel, ah, yes, here is the man as history can remember him, motionless and flat, but we’ve been privileged to view him in full vibrancy, defying gravity—except that that isn’t the way we have seen Nijinsky. By the end of the movie, there’s very little evidence that he is any less ordinary than the other people, and perhaps that’s the film’s greatest failing. First published in The Informer, May 1980. Yes, I sensed the popular demand growing: give us something on Herbert Ross’s Nijinsky! This one feels like a Seventies film, which in some ways it is, with a certain over-dressed, air-brushed aspect. I was just coming to the end of my own “career” as a “dancer” at about this time, which might explain some of my tsk-tsking at Ross’s ham-footed shooting of the ballet scenes, but whatever—I still don’t understand how a former dancer like Ross could fail so thoroughly to visualize the dance scenes. I haven’t seen The Turning Point since it came out, but I think it was shot better than this.